The continuing uproar in the Finger Lakes region over storage of natural and liquefied petroleum gases in salt caverns at Seneca Lake shows no sign of resolution anytime soon. The furor is over construction plans by Crestwood Midstream Partners to expand natural gas storage and add LPG storage in existing caverns on the lake’s western shore. Gas would be withdrawn during the heating season, with the facility connected to an interstate pipeline and options to ship by truck and rail. Supporters of the project say gas has been stored in the caverns safely for many years, and that the LPG facility will protect propane customers from price fluctuations while meeting the needs of homes and businesses because propane is not produced in the state. Opponents of both storage plans see a threat to their safety, health, drinking water supply and the economic sustainability of the region’s hospitality industry because of the potential for heavier industrialization. And there’s no end in sight to all of the wrangling. So far, 180 protesters participating in the We Are Seneca Lake civil disobedience campaign have been arrested at the gates of the Crestwood facility in the Town of Reading, about 2 miles north of Watkins Glen. Those arrested are among more than 300 people who have been trained in protest tactics that include nonviolence, said Sandra Steingraber, distinguished scholar in residence in the Department of Environmental Studies and Sciences at Ithaca College. More than 1,000 people have signed a pledge to protect the lake, meaning there are 700 people who haven’t been trained yet, she said. “We can keep this thing going for quite a long time, and we intend to do so,” said Steingraber, who was arrested at a protest on Oct. 29. The most recent protest campaign began on Oct. 23 in the wake of the Federal Energy Regulatory Commission’s conditional approval on Sept. 30 of Crestwood’s plans to expand methane storage. Crestwood has not begun construction on the propane storage project or the FERC-approved natural gas storage expansion, so protestors are really only interfering with the local salt business, said Bill Gautreaux, the company’s president of liquids and crude. While local officials have said they appreciate people’s right to protest, it doesn’t come without cost to Schuyler County. •The county’s law enforcement cost ranges from $500 to $1,000 per event, depending on the size of the group and number of arrests made. That does not include the cost of state police, village police or other law enforcement agencies that have also been involved. •The county spends $400 on average for each court night to staff the court with deputies. “We don’t have an abundance of staff, so bringing people in for court is overtime,” O’Hearn said. •When it comes to jail time, female inmates cost the county more because they have to boarded in other jails and that also involves transportation costs. On average, the cost for both male and female prisoners is $100 per day, per person. “None of this is a budgeted expense, so it is something the sheriff and the taxpayers are having to absorb,” he said. The protests are affecting more than Schuyler County, Yessman said, noting assistance was needed from Yates County during one protest. “I think the only thing that would make this go away at this point is if Crestwood packed up and left, which isn’t going to happen,” Yessman said when asked if there was any way this situation could be resolved. The protesters don’t represent a single demographic, Steingraber said. She has also heard teachers talk about the threat to children posed by the gas storage facility, such as tanker trucks filled with hazardous materials on the road when teenagers are learning to drive. Others complained about air pollution from the flare stacks and methane leaks that would increase childhood asthma, she said. 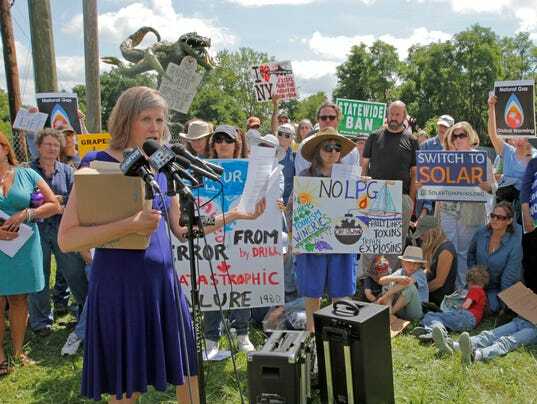 Many grandparents are motivated by their obligation to protect the lake and the region for future generations, while younger protesters in their late teens feel strongly that all the risks of the project are going to accrue to them, Steingraber said. Many who have been arrested have been winery or bed-and-breakfast owners who see the wineries as the source of the region’s economic sustainability, she said. Fewer people will be attracted to a cottage on the lake if the area is heavily industrialized, with flare stacks, the noise of compressor stations and security lights along the banks, she said. Scott Signori, owner and executive chef of the Stonecat Café in Hector, said his livelihood is tied into the tourist industry, the wine trail and this region being a beautiful area to vacation. Storing liquid propane under pressure right on the lake is just an awful idea, he said. “If Crestwood becomes what, in their own words, would be the Northeast hub for propane storage, to me, that’s a conflict of interest. You can’t have it be a beautiful tourist area and have thousands of trucks coming in and using it as a gas station,” said Signori, who was among protesters arrested Dec. 1. But Jim Franzese, owner of Longhouse Lodge Motel and Manor in Watkins Glen, doesn’t see a problem and considers it all a matter of common sense. FERC has said the self-sealing nature of the salt formation and the several hundred meters of rock above the caverns ensures no leakage, and that the walls of a salt cavern also have the structural strength of steel, according to NYPropaneAdvocacy.com, a collaboration between the New York Propane Gas Association and Crestwood. Meanwhile, the state Department of Environmental Conservation continues its environmental review of the planned LPG facility on a portion of Crestwood’s 576-acre site. A draft permit for the project was issued on Nov. 10. Public comment will be received on the proposed project at an issues conference scheduled by the DEC for 10 a.m. Feb. 12 and, if necessary, Feb. 13 at the Horseheads Holiday Inn Express, 2666 Corning Road. The objective of the conference is to determine if there are any significant and substantive issues that would require an adjudicatory hearing. We Are Seneca Lake is focusing on the methane storage increase approved by the federal agency, Steingraber said. They oppose all gas storage but feel they still have redress of grievance through lawful channels for the LPG project, especially with the special issues conference, she said. Another group, Gas Free Seneca, had been fighting both the methane and LPG storage issues but is now focused on LPG, co-founder Joseph Campbell said. Accompanied by business owners and local elected representatives, Gas Free Seneca went to Albany last summer and met with Gov. Andrew Cuomo’s staff, Campbell said. “We must have made an impression on somebody because they’re scheduling the issues conference now,” he said. Dennis Fagan, R-Tyrone, chairman of the Schuyler County Legislature, has been criticized for the legislature’s vote in June to support Crestwood Midstream’s LPG storage facility plans. He also points to next month’s issues conference. Of course, that will depend on whose science is believed. Don Siegel, a Syracuse University professor and hydrogeologist/geochemist, said the Seneca Lake storage site has unique geologic attributes that protect the environment. The engineering design of the brine pits is more than sound, and existing LPG facilities in salt in the Southern Tier that have less engineered controls than the one proposed at Seneca Lake do not leak after years of use, Siegel wrote. “There are many environmental problems people should be concerned about, but I see no plausible scientific or engineering reason why this proposed LPG storage facility should be one of them,” he said. But Dr. Rob Mackenzie, of Hector, retired president and CEO of Cayuga Medical Center, sees it differently. Speaking as a private citizen, he cited his training and experience in health safety work in discussing his findings to quantify the safety risk of gas storage. He found the risk over 25 years is about 35 percent for an extremely serious or catastrophic salt cavern facility disaster, such as fire with explosion, deaths with multiple injuries, temporary or permanent evacuation and major property loss. The riskiest caverns are older ones with geology like those in Schuyler County, he said. Regarding the hazards of transporting liquefied petroleum gas, MacKenzie said he found the overall risk over 25 years to be 42 percent, he said. “The only way to significantly reduce these risks is to not store volatile fuels in Schuyler County’s salt caverns,” he said earlier. Since the 1980s, the number of salt cavern storage sites developed in the United States has grown steadily, the U.S. Energy Information Administration said. Most salt cavern storage facilities were developed in salt dome formations located in Gulf Coast states. In 2012, there were 26 natural underground gas storage facilities and three LPG storage facilities in New York state, concentrated in the central and western regions near both gas production fields and gas transmission facilities, the DEC said. Higher costs resulting from propane shortages and the higher cost of rail and truck transport could be averted with the Seneca Lake facility, and savings from lower costs would be passed on to consumers, according to NYPropaneAdvocacy.com. FERC has repeatedly approved natural gas storage projects using salt caverns in the same formation as US Salt’s caverns at Seneca Lake, NYPropaneAdvocacy.com says. Also, propane and natural gas have been stored safely in US Salt’s caverns for about 20 years, and propane has been stored underground without incident in Steuben and Cortland counties since the 1950s, the site says. State Sen. Tom O’Mara, R-Big Flats, said he has heard both sides of the LPG issue from constituents. Having LPG storage in the region will save money for propane users, O’Mara said. “If you have a closer delivery point to serve the region, you’re going to save on transportation cost. Just having that reserve helps the fluctuations in price. I believe very strongly in diversifying our energy portfolio and having things built in to avoid spiked prices. We certainly saw the spike in prices for LPG least year,” he said. “The arguments are ‘it isn’t going to create any jobs,’ but it is going to create a great deal of tax base, which all of our local governments will find great assistance from in that area in helping with the property tax base,” O’Mara said, noting the New York Farm Bureau recently came out in favor of the LPG project. In a Jan. 6 letter, Dean Norton, farm bureau president, notified Martens of the organization’s support following a majority vote at its annual state meeting last month. The proposed facility aligns with the group’s interests, he said. “It will help lower propane costs for our members, help avoid temporary shortages from arising during the winter months and strengthen our communities by creating jobs and growing the tax base for a county that is in significant need of additional funds for schools, roads and community services,” he wrote. Palmesano said has met with people at town meetings and at his office who have expressed opposition to the project. He has contacted the DEC and relayed the concerns to make sure they are addressed in the evaluation and risk analysis, he said. Palmesano said he understands the arguments and that questions are being raised. “Certainly, we know what we went through with the propane shortage from last year,” he said. “I know there are concerns being raised about truck traffic, although I think a lot of those trucks would be done more in the off-season, in the winter season, when the need for propane is greater, where they do more of their regional deliveries using trains and the pipeline,” he said. Officials see the standoff over Crestwood’s plans continuing for the foreseeable future. Supporters and opponents will soon have their say on a proposed liquefied petroleum gas facility at Crestwood Midstream Partners in the Schuyler County Town of Reading. The state Department of Environmental Conservation, which issued a draft permit for the project, has scheduled an issues conference for 10 a.m. Feb. 12 and, if necessary, Feb. 13 at the Horseheads Holiday Inn Express, 2666 Corning Road. The objective of the issues conference is to determine if there are any significant and substantive issues that would require an adjudicatory hearing. The deadline for individuals or groups to file to participate in the issues conference has already passed. in the Town of Reading have posted information online about their respective positions. Regulatory Commission’s conditional approval on Sept. 30 of Crestwood’s plans to expand methane storage in salt caverns at Seneca Lake.